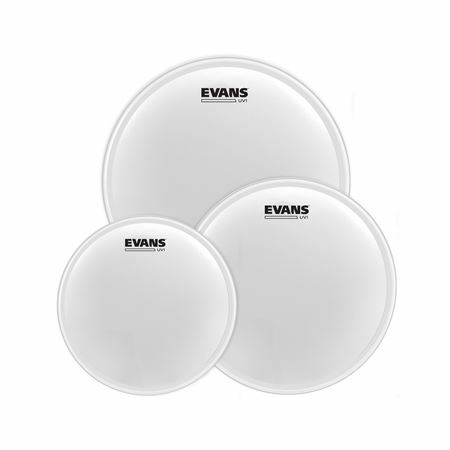 Order your Evans UV1 Fusion Tom Pack Coated 10 12 14 from AMS and enjoy Fast & Free Shipping. Get the Best Deal with our Lowest Price Guarantee & Great Customer Service! Save more when you purchase an Evans Fusion Tom Pack. The UV1 series is designed for the widest range of sonic possibilities while remaining the most durable single-ply drumhead available. The patented UV-cured coating provides unmatched durability and consistency of texture, while the unique 10mil film delivers exceptional strength and versatility for a full range of musical applications. UV1 drumheads are the number one solution for drummers who are tired of flaked, chipped, and worn out coatings. They also feature increased surface texture making them extremely responsive for brush playing. Combined with Level 360 Technology, the UV1 series is the most versatile and durable 10mil drumhead drummers have ever laid their hands on. Evans can hardly do wrong. Great product, great price. Very durable and consistent in their heads.